WATERLOO – Celebrated conductor Raffi Armenian will be leading Laurier’s annual winter opera production staged by students in the Faculty of Music. Armenian, one of Canada’s top conductors, who also has close ties to Kitchener-Waterloo, will be leading a student performance of Leoš Janáček’s The Cunning Little Vixen in late February. Prior to conducting the show, he will fulfill a six-week residency at Laurier, rehearsing with the students on a regular basis. 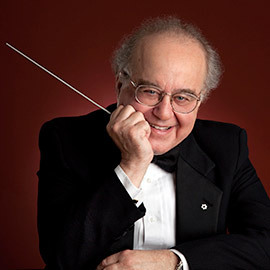 Serving as conductor and artistic director of the Kitchener-Waterloo Symphony (KWS) from 1971-93, Armenian is widely credited with establishing the KWS as a leading orchestra in Canada. Under his guidance, the company grew from a small group of amateur musicians to a professional symphony that attracts talent nationally and internationally. To honour Armenian’s many contributions to the KWS and music in Waterloo Region, the main theatre at Kitchener’s Centre in the Square – the central performance venue of the KWS and a facility Armenian played a key role in creating – is named in his honour. Born in Cairo, Egypt in 1942, Armenian studied piano at the Vienna Academy of Music before putting his musical pursuits on hold to study engineering at the University of London from 1962-65. He returned to Vienna in 1965, completing his studies in 1969, and then moved to Canada to take up an assistant conductor post with the Atlantic Symphony Orchestra in Halifax. Following his 22-year stint leading the KWS, Armenian was appointed director of orchestral studies at the University of Toronto in 1999, later holding the same position at Montreal's Conservatoire de Musique. Armenian still maintains his connection to the KWS, holding the position of music director laureate. In 1991 he became a member of the Order of Canada and received an honorary doctorate from Laurier. Laurier Music’s performance of The Cunning Little Vixen will run Feb. 26-28, 2016. For more information, visit wlu.ca/music.